This read was a more random choice trying to fulfill my reading challenge prompt of “a book by a female author using a male pseudonym”. I didn’t realize when I started that this was one of a continuing series of crime thriller (number 29 in fact! ), but it was written in a way that made reading it independently of the others wasn’t a problem. Eve Dallas’ plans for a quiet night in are dashed when she receives an urgent call from her superior to be the lead investigator when the newly promoted police chiefs teenage daughter is found dead. When Eve arrives to the scene she finds the young girl has been brutally raped and strangled to death. Delving into such a case brings up memories of her own past trauma, but Eve digs in her heels and gets to work. When another woman turns up dead, killed in the same fashion, Eve knows she is running out of time before the killer strikes again. Connecting the dots and digging into clues is Eves specialty. Can she connect the dots fast enough, or will the tech savvy murderer slip through her grasp to finish his murderous revenge? I didn’t realize when I started this one that it was set in the future, 2060 to be exact. Although it wasn’t too scientifically advanced from current day to be distracting, it did make for an interesting take on a murder mystery. This book was pretty graphic and grizzly when discussing the details of the rapes/murders which honestly seemed overdone at times. The constant discussing of the case details with all the various characters seemed a bit too much and would have been much better without in my opinion. Overall it was entertaining and engaging. It kept my interest with the swiftness of the action and plot development (the whole book spans only a few days). The characters were likable enough if a little cliched. I did appreciate Eves tough as nails attitude and fearlessness. Like a dog with a bone, Eve Dallas does not give up on a case, she digs in, tooth and nail, devoting all her time and energy to bring justice to victims. 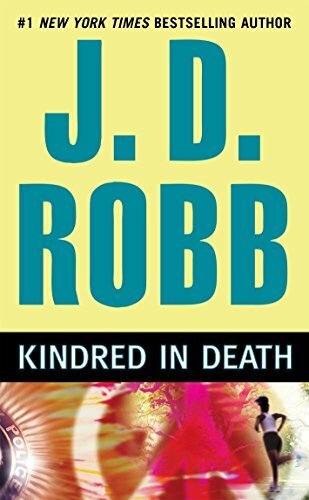 Kindred in Death is number 29 in this series (wow right?!) If murder mysteries are your thing, this series has got you covered for quite a bit of reading!